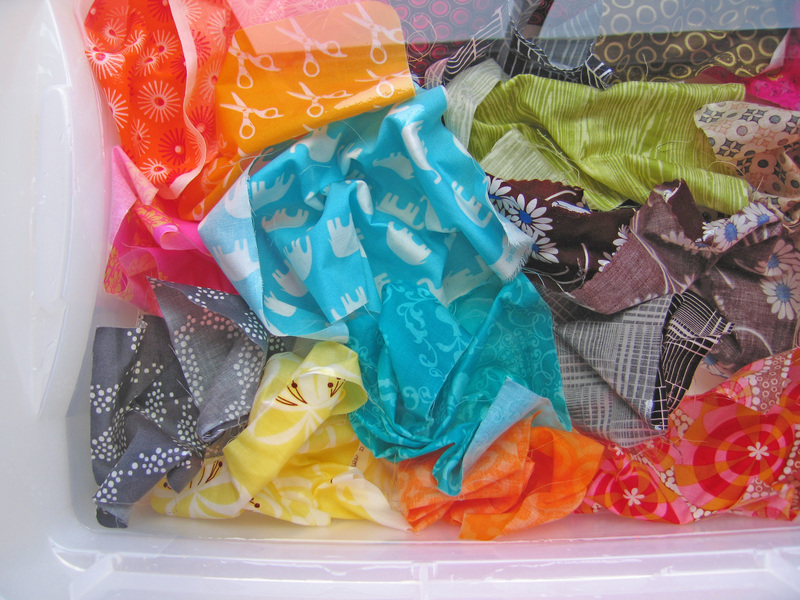 Dyeing and overdyeing fabrics is fun, but the time and materials involved can be overwhelming. Fortunately, there’s a fun and simple way to alter your favorite print fabrics using a product that’s probably already in your laundry closet (or at least readily-available at your local grocery store). Bleach discharge is very simple. Fabric is soaked in a water and bleach bath for a period of time, during which the bleach in the water may discharge (remove or alter) some of the dye in the fabric. All fabrics don’t discharge in the same way. 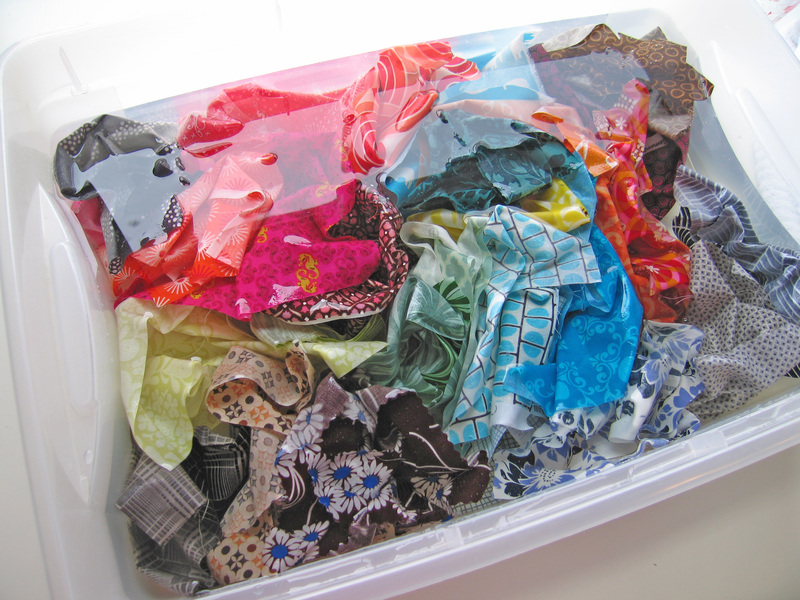 In fact, some won’t discharge at all, which is why I thought of this project as an experiment – I went in to it not really knowing what was going to happen to my fabric! This is a very basic run-through of how I altered fabric using only bleach and water. Although I didn’t worry about this during my experiment, fabric that has been exposed to high concentrations of bleach for long periods may become damaged. 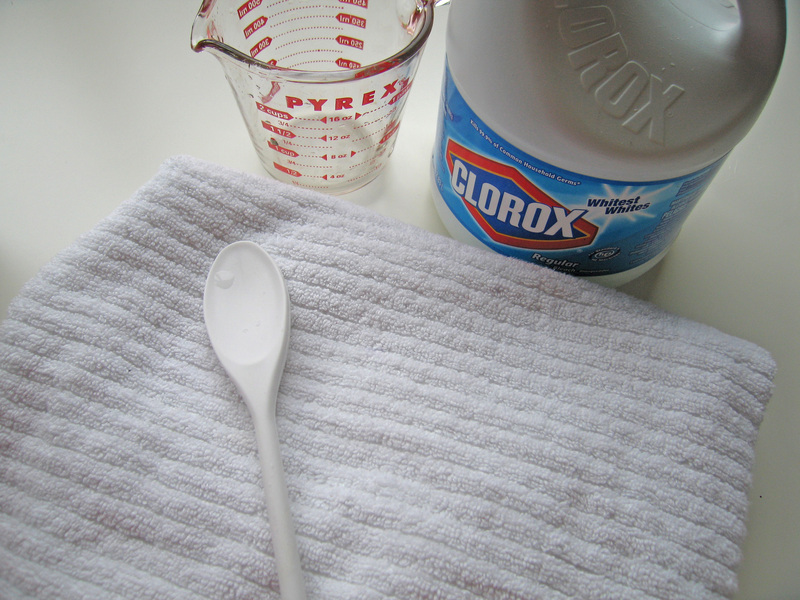 Serious dyers and fabric artists have a variety of methods for arresting the action of bleach on fabric. If you’re interested in reading more on this subject, I recommend Malka Dubrawsky’s excellent book, Color Your Cloth. 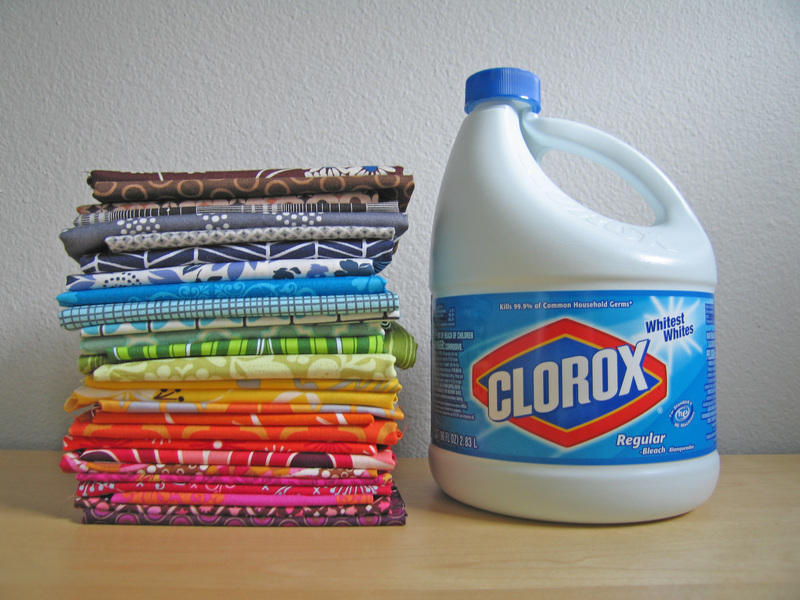 Bleach is toxic and it can ruin your clothing, carpet, etc. If you attempt this project at home, wear old clothes, keep a large towel in your work area, and don’t use any containers or measuring tools that you normally use for food. 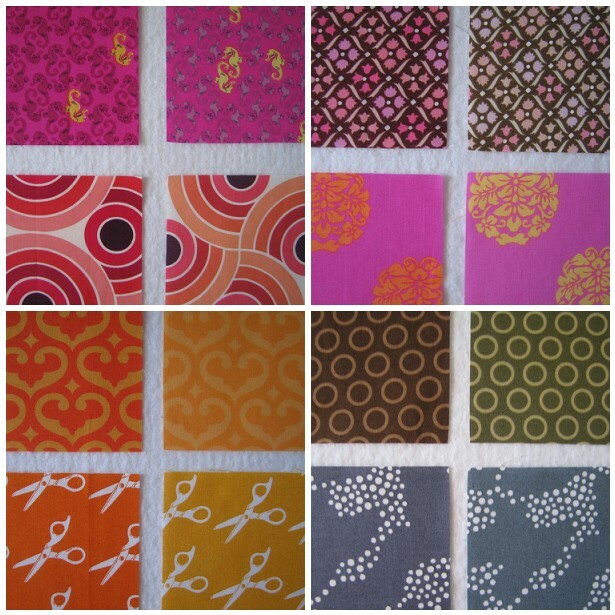 I wanted to see a “before and after” swatch of each of my fabrics, so I started by cutting 2 squares about 9” x 9” from of each of my fabrics. 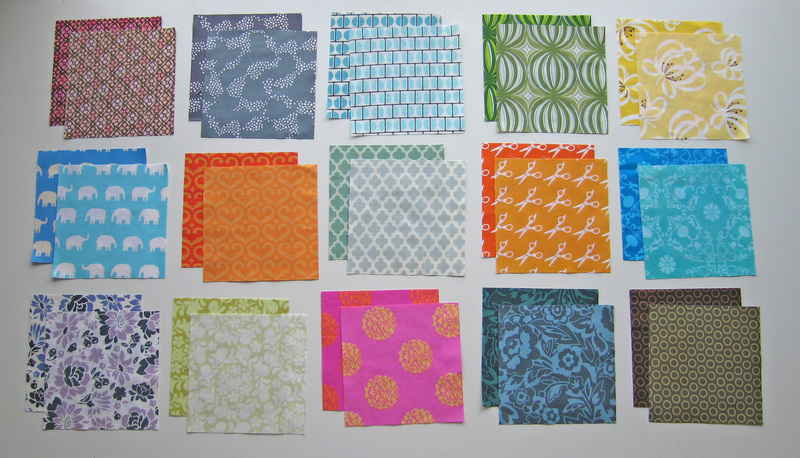 I chose quilting fabrics in a rainbow of colors, including some neutrals. I then filled an empty storage tub and prepared a bath of 3 gallons lukewarm water and 3 cups bleach. One by one, I added the fabric squares, using a plastic spoon to make sure that each piece was completely wet and submerged. I let the fabric soak in the bleach bath for about 5 minutes, stirring occasionally. At that point, some of the fabric had already discharged quite a bit, but some of it looked exactly the same. I removed the fabric that was already obviously different and rinsed it out in the sink. This process was repeated over the next 10 minutes or so. I continued to stir occasionally and to remove fabric that appeared to be ready. 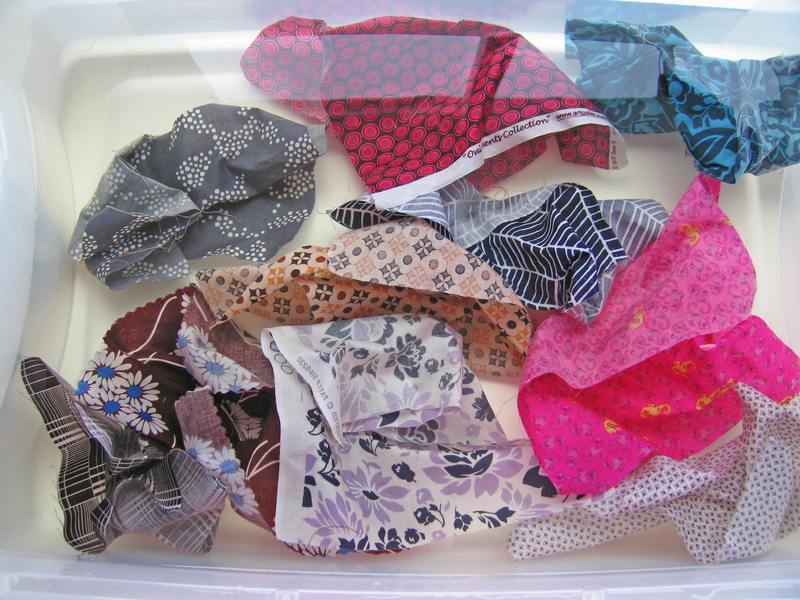 After 15 minutes, several of the neutral fabrics still didn’t look different to me, but I didn’t want to leave them in the bath any longer. I washed all of the fabric in a gentle machine cycle with hot water and machine dried them on low. Two of the fabrics didn’t seem to have discharged at all. The “before” and “after” looked pretty much the same. Several of the fabrics discharged a little bit, but the change was so subtle that I really had to look to see it. 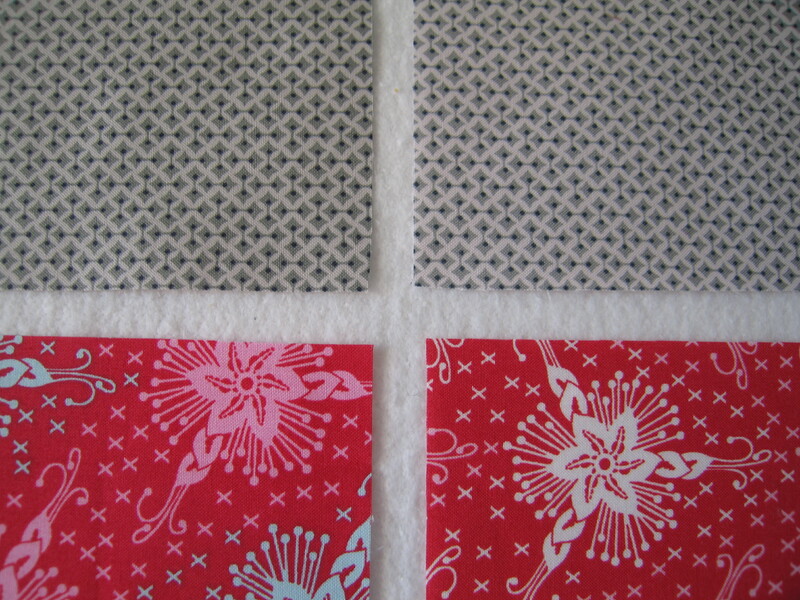 Combining the “before” and “after” fabrics into patchwork blocks can also be a lot of fun. 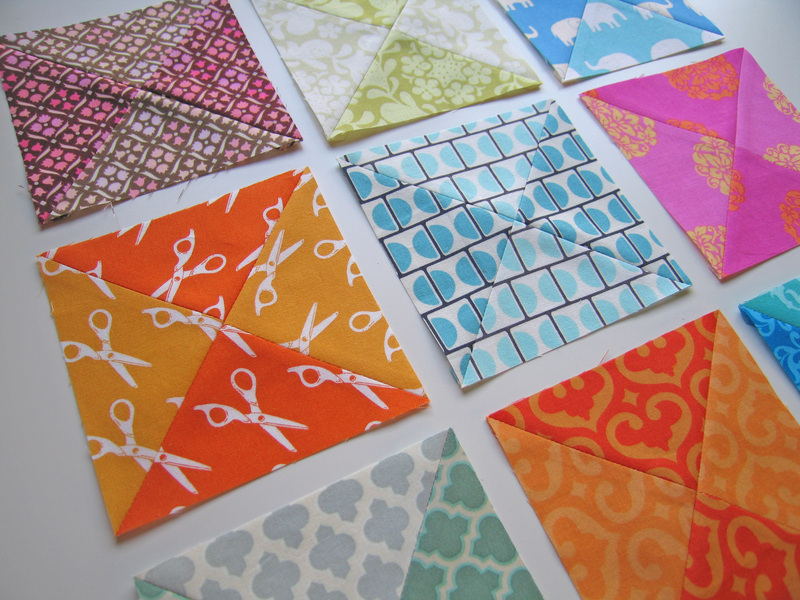 Here are some simple hourglass blocks that I made with some of my fabric. All in all, I think the experiment was a success. 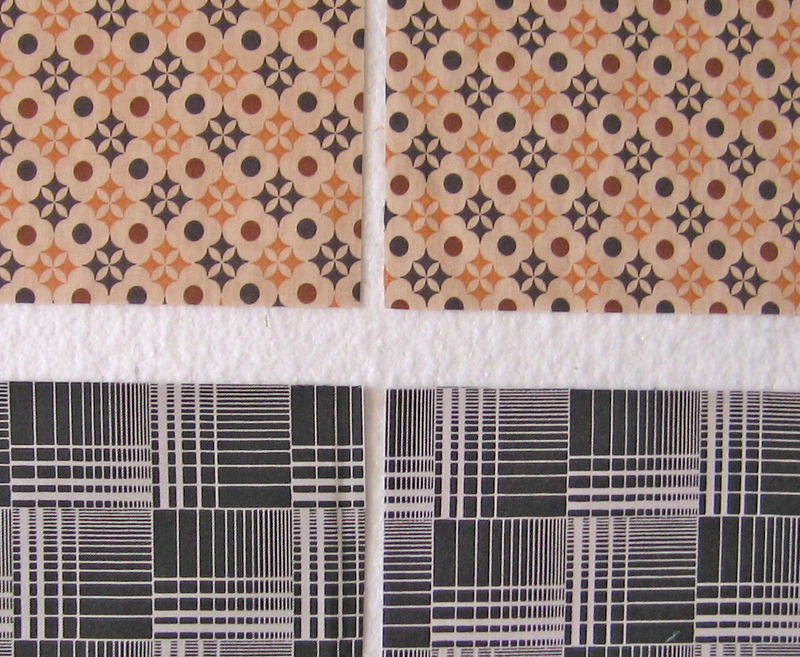 It was fun to see the prints transform and to consider different ways that the discharged fabric could be used. Thanks so much for joining us for the Week of Prints! 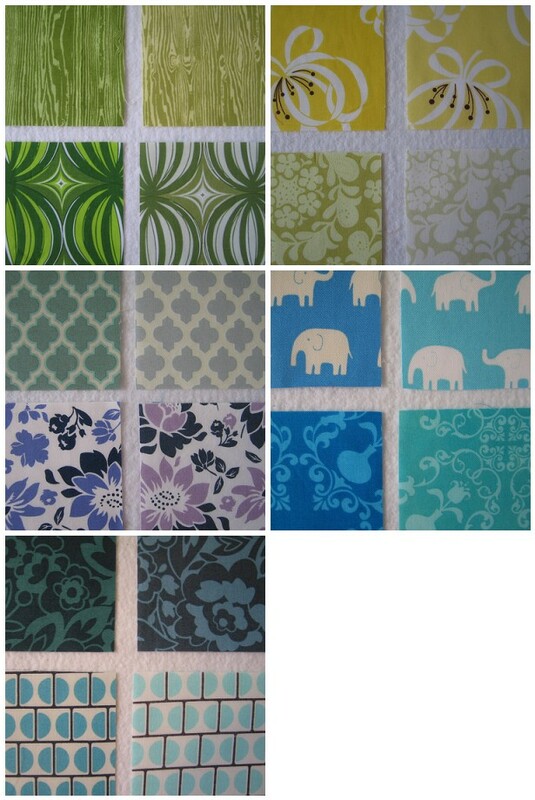 Stay tuned for more of 100 Days of Modern Quilting.